Gaining life and rejoicing in indestruction. On the sixteenth Tychon went to dwell beneath the earth. Saint Tychon flourished during the reigns of Arcadius (383-408) and Honorius (395-408). Having pious parents who loved Christ, they dedicated him to God and he learned sacred letters. After sufficiently studying Holy Scripture, at first he became a Reader, and in the church he would read the divine words to the people. 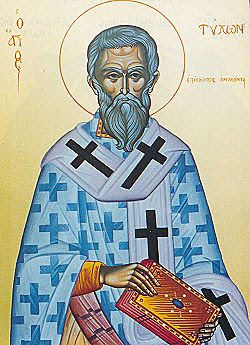 Then due to the suitableness he had in all things, as well as his pure and blameless life, he was ordained Deacon by the most-holy Bishop Mnemonios of Amathus. 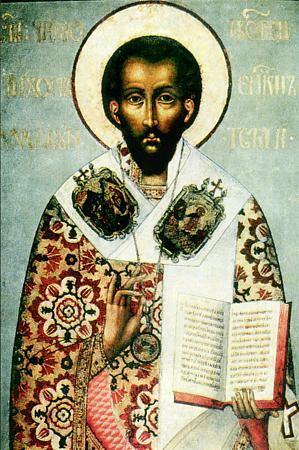 After he died, Tychon was elevated to the throne of the diocese, by the great Saint Epiphanios of Cyprus. Thus by the words of his teachings he turned many from the error of idolatry to the faith of Christ. He destroyed many pagan Greek temples, and the idols within he crushed. With such eminent virtuous actions, he departed to the Lord, having worked many miracles while he was alive as well as after death, of which I will narrate one or two of them below, to demonstrate the virtue and holiness of this divine man. When the Saint was a youth, his father who was a bread-seller would give him some breads to sell to buyers, but he, instead of selling them, would give them away to the poor. When his father learned of this, he became enraged, because from this job he would produce the income for his household. Tychon would say to his father, that he was letting God borrow the breads, and that he had written testimony of what was owed that it was received by God. And O the miracle! - immediately the words of the Saint became true and practicable, for the granaries of his father were found to be full of wheat, more than they could fill when the wheat was brought from the plantation. This miracle, although great, has been done by other Saints as well. The All-Good God is not absent from giving wheat to people, and His other good things, so that people would richly distribute alms to the poor. His biggest miracle, which we only see this Saint glorified by, and has no resemblance with any other, is the following. The Saint planted a vine, which was found to take root, and immediately sprouted leaves, then bloomed, then produced grapes, and these grapes were ripe and sweet. In which other area of Cyprus are ripe grapes produced on the 16th of June, which is the day the commemoration of the Saint is celebrated? None, of course. This strange thing takes place in the following manner. The vine planted by the Saint has unripe grapes when the Divine Liturgy begins on the feast of the Saint, and then the unripe grapes of the vine begin to blacken and ripen. When the Divine Liturgy is completed, then the grapes become ripe, sweet and serviceable to eat. God called thee to the sacred priesthood, as a worthy servant of the Holy Trinity. Thou didst shine with the grace of godliness, and strengthen the Church by many miracles. O Venerable Tychon, pray to Christ our God to grant us His great mercy. Thou wast resplendent in asceticism, O beloved of God, and didst receive power from the Holy Spirit, to destroy idolatry, put demons to flight, to save souls and to heal the sick. We honour thee, O blessed Tychon.